In this series of lectures Stephen W.Hawking tries to give an outline of what we think is the history of the universe from the big bang to black holes.The first lecture briefly reviews past ideas about universe and how we got to our present picture.One might call this the history of the universe. The second lecture describes how both Newton s and Einstein s theories of gravity led to the conclusion that the universe could not be static:it had to be either expanding or contracting.This,in turn,implied that there must have been a time between ten and twenty billion years ago when the density of the universe was infinite.This is called the big bang.It would have been the beginning of the universe. The third lecture talks about the black holes.these are formed when a massive star or an even larger body collapses in on itself under it s own gravitational pull.According to Einstein s general theory of relativity,any one foolish enough to fall into a black hole will be lost forever.they will not be able to come out of the black hole again.Instead,history,as far as they are concerned.will come to a sticky end at a singularity.However,general relativity is a classical theory that is,it does not take into account the uncertainity principle of quantum mechanics. The fourth lecture describes how quantum mechanics allows energy to leak out of black holes.Black holes are not as black as they are painted. The fifth lecture shall apply quantum mechanical ideas to the big bang and the origin of the universe.This leads to the idea that space-time may be finite in extent but without boundary or edge.It would be like the surface of the earth but with two more dimensions. The sixth lecture shows how this boundary proposal could explain why the past is so different from the future,even though the laws of physics are time symmetric. 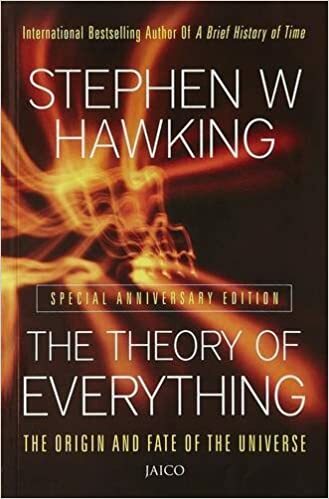 Finally,in the seventh lecture Stephen W.Hawking describes how we are trying to find a unified theory.